The outdrive must be off the boat to use this technique ! 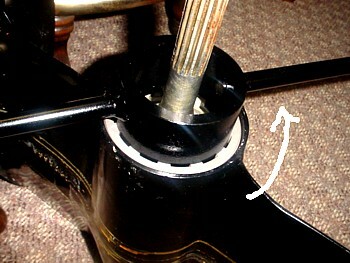 Bend back the 1 locking tab washer inside of the nut. 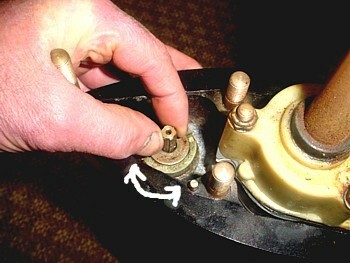 Unscrew the 4 3/8 lower carrier nut with above tool or equivalent. Click here for lower carrier wrench. Note ! It may be necessary to heat the outside of the lower housing. If it is not possible to unscrew the old nut it may be necessary to drill 4 holes thru it and punch the broken pieces inwards. Click here for drilling fixture. Removed the 4 3/8 stainless locking tab washer. area marked with 2 arrows. If you have not separated the upper and lower housings. 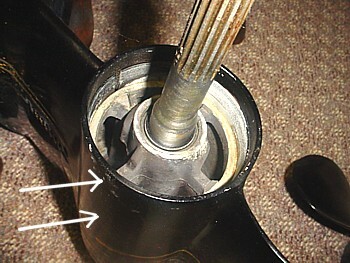 Feel the left to right looseness in the brass shift lever located in the upper housing. Keep this looseness in mind. If you have separated the upper and lower housings. 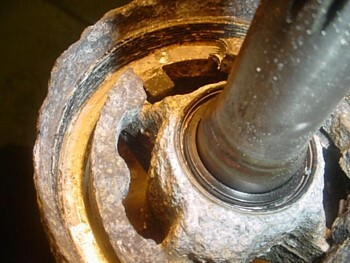 Feel the left to right looseness in the lower shift shaft located in the lower housing. Keep this looseness in mind. 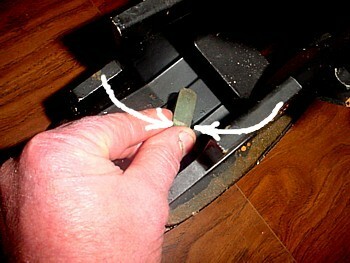 Place 2 pieces of wood, 1/2 to 3/4 thick across the carrier opening as shown. 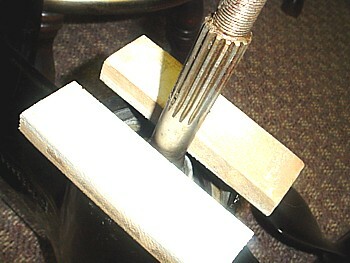 Put your prop on the shaft against the 2 wooden blocks. 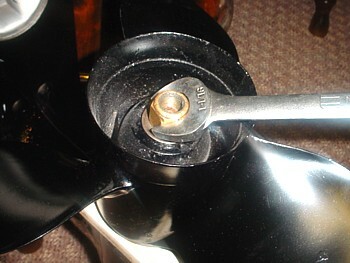 Use a large washer and your prop nut to pull the carrier 3/4 of an inch out of the housing. You can only pull the carrier out this way about 3/4 of an inch or until you feel the shift lever looseness getting tight. When the shift lever gets tight, remove the prop and reach in and you should be able to pull the carrier out the rest of the way with your fingers.